TransDev, the UK’s leading power transmission manufacturer and distributor now provide chain products from three world-class manufacturers, allowing its customers more alternatives for application performance and budget matching. Standard and specialist chains, sprockets and related components are sourced from German, Japanese and other Asian manufacturers. They are fully supported by TransDev’s complete application support service to provide its customers with one of the most comprehensive chain ranges available from one supplier today. Top of the TransDev range is Wippermann GmbH, Germany’s number one manufacturer of high quality, high precision steel roller chains, offered in simplex and multiplex forms to both European and USA standards. Available in pitches from 5 mm to 100 mm with matching sprockets and accessories, the full range includes a stainless steel option, special attachments for conveying and parts handling and a whole host of specialist chain alternatives, including leaf chains, bush chains, easy break chains and silent tooth chains. Wippermann has ISO 9001 approval and enjoys an enviable reputation for high-quality and premium customer service with a commitment to excellence in its research, development, manufacture and assembly divisions. For fit-and-forget applications or for cost effective pay-back on demanding installations, Wippermann’s “Marathon” maintenance-free chains offer the maximum in long-life and maintenance-free performance. 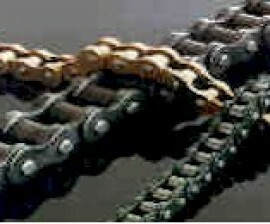 Thanks to a unique design with sintered bushings and specially coated hardened alloy steel, Marathon chains offer up to thirty five times greater service life in comparison with standard roller chains without lubrication and up to five times greater service life in comparison with other manufacturers maintenance-free chains. Furthermore its precision manufacture and pore-free coating ensures an excellent sliding performance. TransDev’s third supplier is D.I.D, the leading Japanese chain manufacturer of specialist environment resistant and long life chain products. The range includes the LU series with a special porous film coating, designed to retain lubricant where grease and oil dispersal is not allowable in applications such as textile manufacture and food packaging. D.I.D also produces specialist chains in stainless steel or exotic alloys, nickel plated finishes and with hard carbide coatings for improved life. The LD-BL series offers contaminant resistance and five to twenty times longer operational life than standard chain with its unique O-ring seal system and is ideal where particle borne or dusty environments persist such as agricultural machinery or in construction industry applications. For budget conscious applications the TYC range brings ISO 9001 manufacture and “eastern pricing” to the decision process. TYC are a long established manufacturer of quality chain with factories in Taiwan, Thailand and China with a comprehensive range that includes pre-stressed components with seam orientated bushes, lubricated and ready for use. The full range includes ISO and ANSI roller chain with many specialist options including attachment chain, leaf chain, motorcycle chain, agricultural chain and many other options. 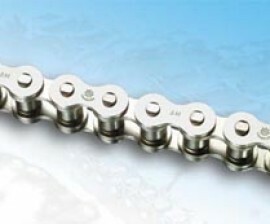 Like all Transdev’s power transmission products, its chain and chain accessories are backed with comprehensive application and post sale support including an optional premium 24 hour service where stock chain products can be replaced and immediate manufacture and despatch of made-to-order products can be provided in a machine breakdown situation.